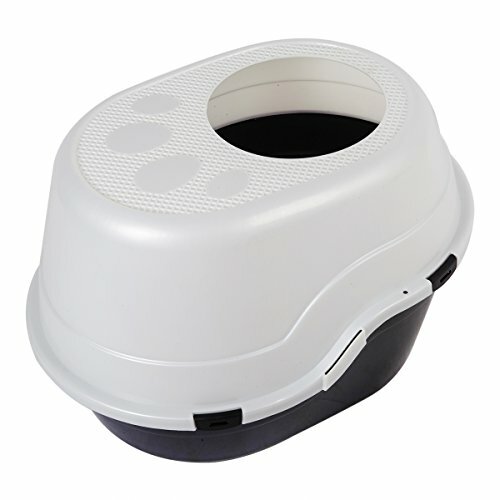 » Do You Want A Reliable ‘Dog Proof’ Cat Litter Box Solution? 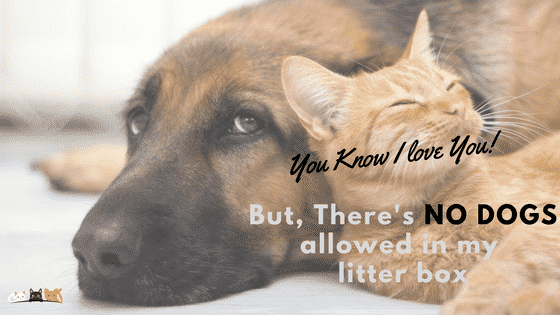 Are you a ​cat only household or a cat and dog household? We are a cat family (currently) with​ a visiting dog, not a permanent fixture. So ​it is essential to either get a cat litter box that is dog proof or dog proof the existing litter box. How Do You Dog Proof A Litter Box? In Case You Were Wondering? Why Do Dogs Eat Cat Poop? Use a cat litter box that has features expressly for the purpose of deterring dogs. This will mostly mean the litter box will have a top opening. Put the litter box up high where the cat has access but not the dog. This may work for some but does have drawbacks too. It is not so good for older cats and don’t discount the inquisitive dog making repeated valiant attempts to reach the box. Make your own dog proof litter box. The video below has clear instructions and reasons for making certain choices in the construction. We have reviewed the five most popular dog proof litter boxes, explained how they work to deter a dog plus the features and necessary information for you to decide which one would suit your needs. The box measures 20 inches from the front to the back, it is 15 inches wide and 15 inches deep. The entry at the top of the box is 9 inches in diameter. In addition to deterring any dog activity, this box is great for cats who love to dig and fling litter around. The surface on the top of the box is ribbed, (as can be seen in the photo) which ​helps to contain any litter stuck on paws. The height of this box should be enough to deter most dogs and even if your dog is large he would still need to be able to put his head right down through the hole which is 9" in diameter and lower his head 15" to the bottom of the box. This would be challenge. This box would not be so good for elderly cats or cats who are unwell. It may be too difficult for these cats to enter and leave the box. However, our cat is definitely elderly and he is still jumping, so all cats are different in this regard. Some people with large cats, give this box the thumbs up however consider the dimensions and weight of your cat before buying this box. This box is great if your cat is an elevator pee-er and this is because the depth of the box means there is no where for the pee to get trapped. ​​Jumbo liners for this litter box fit comfortably over the box and don't fall back into the box once the litter has been added. This box is specifically designed to keep dogs out of the litter. It has a non slip top and also a grate which allows litter to fall back into the box instead of scattering all over the floor. The measurements are 20" x 15" x 15" (the same as Clevercat). Be aware that if your cat is elderly he may have trouble jumping. This also applies ​ to Clevercat box or any top opening box. I have to say that our cat who is heading towards 17 is still able to jump up onto the bed and generally get to where he wants to, so this very much depends on the cat. ​As it is fairly lightweight box it would be best positioned in a corner ​so that a large dog can’t push it around. The box itself is excellent and has positive reviews for working to keep the dog out of the litter. This box will deter medium to large size dogs and smaller dogs would have difficulty reaching right down in the box. The design elements make the product efficient. It is easy to empty the litter using the built in handles. The hinged lid also helps with handling. Watch the video to see this in action. This box measures 16" x 16" x 15" and weighs 5.3 pounds. The box is so cute and would suit any decor without screaming “litter box” over here. The price tag does reflect the design and materials used to make the box however if your space is cramped and the litter box is on show, this is as much a practical decision as a decor decision and it does fulfill both purposes. The finish on the box is glossy white or glossy orange. It is virtually impossible for a dog to enter because of the cat sized entry (approximately 9" diameter) in the lid for the cat to exit and enter. The ModCat litter box has a super cool, reusable, tough tarp liner that is designed to be reused. As it is a very sturdy liner it easily lifts in and out of the box without collapsing. Originally the liners were blue but newer models will have gray liners. 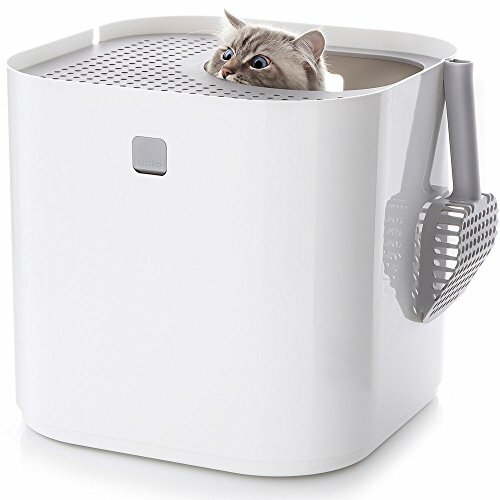 You will love this box if the design aspect appeals to you and you want a litter box that works very well to keep dogs out but is also a top notch design to suit any decor.This box also has the litter scoop feature where the scoop is attached to the box. ​The video shows the design features, one of which allows the litter to fall back into the bag before removing the lid. This is a popular product for keeping the dogs away. Even a large dog like a German Shepherd finds it difficult to get down inside this box. The measurements of this box are 24.5"×19"×16.5" (L×W×H). 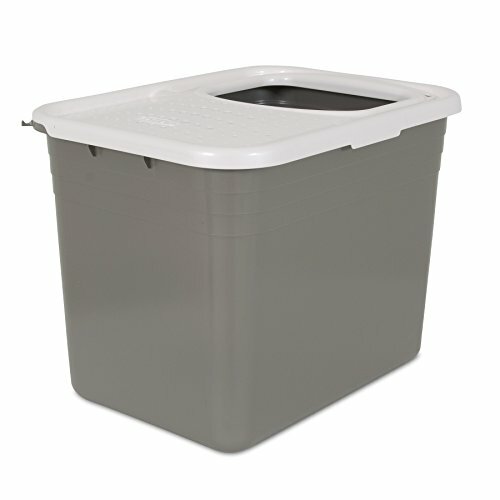 This box does not have specific liners however these litter box liners work well and are mentioned often as a good fit. Not everyone wants to use liners in the cat litter box. The finish on the interior of this box is a smooth and hard plastic, making it easy to scoop and clean. The clips on the side of the box are easy to operate and the top removes easily for cleaning. There are two clips on each side, so four clips altogether. Cats, up to 24lb have used this box successfully, however ultimately the success will be dependent on your cat's willingness to use a top opening litter box and your willingness to persevere trying different methods if he is unwilling. This box has good results with deterring both small and large dogs. If you have two cats this box is large enough to use for two cats. Litter tracking is reduced as the cats have to pause before leaping out of the box so some litter will fall back into the box. This box gets good reviews for keeping the dogs away and that includes dogs who are nosey and like to hang around to see what’s going on. The measurements of this box are 8.75 x 25.5 x 20 in. This box weighs 3.5 lbs. See the weight comparison table below. A large dog will have more difficulty knocking over a heavier box particularly once it is filled with litter. Small dogs are put off by this box. Larger dogs though have knocked the box over, so consider placing it in a corner. 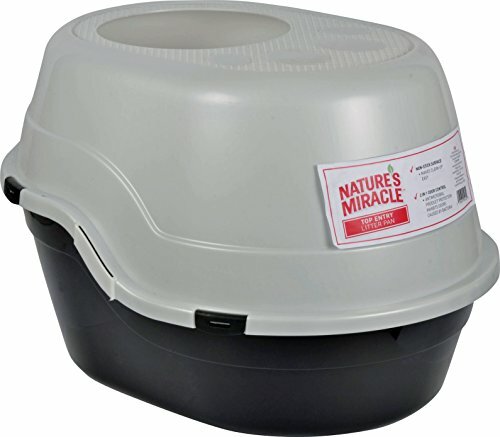 Large cats up to 25 lbs have used this box and as a bonus odors are kept to a minimum. 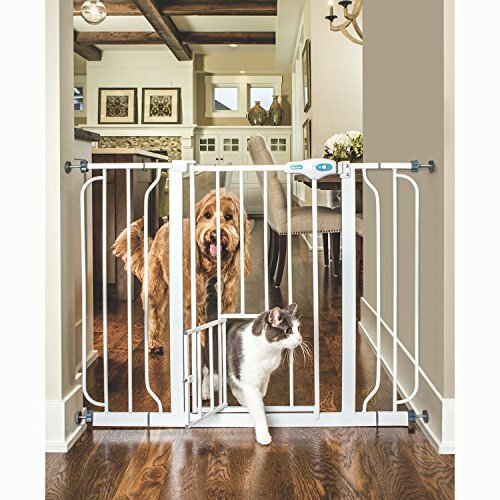 This is a pet gate, with a large opening door for dogs and humans but also a small door that is perfect for cats. ​You won’t need to alter the current litter box arrangements. That can be a big plus as kitties don’t always like having their litter box regime changed. The gate is expandable and is 30 inches high however there are many other Carlson gate options of different sizes. Click here to see a larger selection of gates. It is steel and non toxic, even chew-able so if crawling toddlers are also on the go, this gate will solve more than one problem - keeping dogs and small people away from the litter whilst providing free access for kitty. Kitty is the winner here. Disclaimer - This is primarily a pet gate so may not be suitable for keeping out small people. It is also a piece of equipment that you could easily pass on to others (friends or family) if or when it was no longer needed. It uses a pressure mount system making it extremely easy to put into place. Another plus, so that if the litter box is moved to a different location, the gate can be moved also. The handle has a one touch release so if if you are carrying items it is a simple procedure to open the gate. Regular tension gates without the door may be suitable but it would mean that the cat would need to jump over the top. This would be no good for older cats plus it is such a hassle stepping over these gates and it does become tiresome. Jess from Parent Guide has this to say about the gate. This video shows the gate in operation. This is a brilliant instant solution. It installs in seconds using strong adhesive so it can literally be out of the packet and installed immediately with no skills or tools required. YAY! FAQ - Yes, you can buy extra adhesive if needed. The width is adjustable and there’s also instructions for installing with different door types, for example, bi fold doors, swinging doors, pocket doors, double doors and push or pull doors. The nifty little door stop means that the door can’t be accidentally closed locking your kitty cat inside the room. If you are leasing, the product can be removed without damaging the wall however if it was forcibly pushed by an adult or very large dog, there is a chance that it could damage paint. 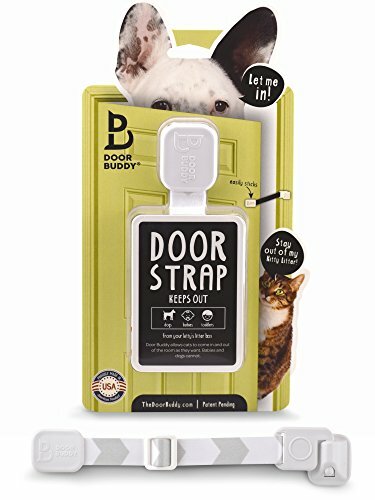 The video shows the Door Buddy in action. It allows enough space for the cat to enter the room however keeps everyone else out, including dogs and crawling babies or toddlers who are the common offending culprits when getting into the cat’s litter box. 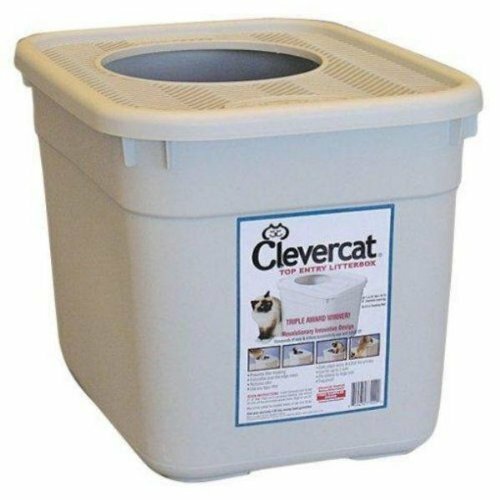 For excellent results in keeping dogs out of the litter box (bye bye doggy) we highly recommend the Clevercat top entry litter box. ​A dog would need to put his head through the 9"diameter hole in the top of the box and then lower his head ​approximately 15" to reach the litter. ​Here are some recent comments regarding a dog proof solution litter box. The Modkat litter box wins hands down regarding design and coordinating with decor plus keeping dogs at bay. The design features are reflected in the price so this litter box is more of an investment for long term. ​Solutions other than getting a new litter box to keep the dog away from the box. We love the Carlson Pet Gate for ease of use and the longevity of the product. The Door Buddy for its clever design and ease of use and instant installation is an excellent product all round and will solve the problem in an instant. Why is it that dogs like to eat cat poop? Yep, it sounds pretty disgusting but let’s give our canine friends a little bit of leeway here. One of the reasons dogs eat cat poop is because the poop contains vitamins and minerals that may be lacking in the dog’s diet, specifically protein, so the cat poop actually works as a supplement. They are just going about finding a supplement for their diet in their own doggy way. Previous Post Cat Drinking Glasses Are Guaranteed Fun And A Little Bit Crazy Next Post Cat Litter Box Liners With Elastic – Why Are They So Popular?